Imja Tse peak, at the height of 6,189 meters (20,305ft), is more popularly named as Island Peak. The peak was named Island peak by Eric Shiptons, Party in 1953, as the peak resembles an island in a sea of ice when viewed form Dingboche. Later in 1983, the peak was renamed as Imja- Tse. The peak was first ascended in 1953 by a British team (including Hillary) as preparation for climbing Everest. Tenzing Norgay was one of the members who successfully ascended. There were only handful climbers around 1953 but thousand of climbers climb this peak every season nowadays. The peak is to be the part of the south ridge of Lhotse Shar and the main land forms a semi circle of cliffs that rise to the north of the summits of Nuptse, Lhotse, Middle Peak and Lhotse Shar. Cho Polu, Barunche and Makalu lie to the east of the Island Peak. , Amphu peak and Amadablam lie to the south. Lobuche Peak actually includes two different summits, East 6,119 meters (20,075ft), and West 6,145 meters (20,160ft). An uninterrupted edge links them but there is a significant distance between these two peaks. The east is identified as a trekking peak while the west is regarded as an expedition. Lobuche East Peak, an eye-catching trekking peak offers a range of existing routes as well as new ones. The first scaled to the Labuche east peak by Laurance Nielson and Ang Gyalzen Sherpa on 25th April 1984. The gloomy triangle of its rocky east part sets down to the moraines of Khumbu Glaciers to a pleasing skyline, making the south face. Lobuche East is ascended by moving down a marked rejuvenating point and walking up steeply from snowy slopes to the top. The Lobuche East peak rewards you with the views of the mighty Mt. Everest as well as you will witness several peaks of the Rumbuk region of the Tibet. The ecstatic moments that you will capture after scaling one of the famous Peaks in the Everest region - Lobuche East will grab your attention for ever. Mount Everest, Mount Makalu, Mt. Amadablam , Nuptse, Mt. Lhotse and Khumbu glacier; different community with large number of Sherpa and splendid Himalayan landscapes, old monastery and flora–fauna i.e. musk-dear, Snow- leopard, Mountain-goat and Primola-denticuleta (Prim Rose) are the major fascination of the trip. Firstly, we take 35 minutes of scenic flight; Kathmandu to Lukla, 2,860 meters (9,383ft), the most famous Hillay airstrip in the world and starts fascinating journey through the famous mountaineer Sherpa’s villages. The trail passes most of the times with stunning mountains views, highly fascinating Sherpa cultured lands and rich of flora and fauna. Phakding and Jorsalle are the main entrance of Sagarmatha National Park, where trekkers have to entry permits before entering into the National park. World-wide popular place, Namche is the main gate-way to Everest region trek. Today our route separates from Namche bazaar, we take opposite route of Everest base camp usual/direct trail. Our trail moves towards Thame, Tenzing Norgye’s birth place, cross Renjo La pass 5,360 meters (17,585ft), having captured panoramic view. We head down trail to visit awesome Gokyo fifth Lake. We again climb up crossing Cho La-pass, finally we reach at Labuche base camp 5,200 meters (17,060ft). However, we do not directly climb the peak, first we reach Everest base camp 5,364 meters (17,598ft), and visit Kalopathar 5,550 meters (18,208ft), for proper acclimatization. Working out of Labuche peak, we move to Island peak base camp through Khongma La, Chhukung. After climbing these two peaks successfully, we trek back to Lukla via Tengbuche and Namche. Day 01: Arrival in Kathmandu Airport [1,340 meter/4,429ft], transfer to Hotel. Day 02: Special climbing preparation day, permits and geears. Day 03: Fly to Lukla [2,860m/9,383ft], trek to Phakding village [2,610m/8,563ft], 3hrs. Day 04: Trek Namche bazzar [3,440 meters/11,286ft], 5 hours uphill. Day 06: Trek to Thame village [3,820 meters/12,533ft], 4 hours. Day 11: Cross Cho La pass [5,375m/17,634ft], descend Dzonghla [4,830m/15,846ft],7hrs. Day 12: Trek to Gorapse [5,171m/16,965ft], 5 hours, the famous EBC trail. Day 13: Hike to kalapathar [5,550m/18,208ft] and EBC [5,364m/17,598ft], 8hrs. Day 14: Trek back to Lobuche East high Camp [5,200 meters/17,060ft] 6hrs. Day 15: Attempt to Lo-buche East Peak [6,119m/20,075ft], back to Base Camp. Day 17: Trek to Khongma La [5,535m/18,159ft] and Chhukung [4,730m/15,518ft], 8hrs. Day 18: We trek to Imja-Tse (Island) base camp [4,970m/16,305ft], 3 hours. Day 19: Summit to Island peak [6,189m/20,305ft], 12 hours walk back to Chhukung lodge. Day 21: Trek to Tengbuche [3,860 meters/12,664ft], 7 hours. Day 22: Trek back to Manju [2,835 meters/9,301ft], 7 hours. Day 23: Trek back to Lukla [2,860m/9,383ft], 5 hours. Day 24: Fly to Kathmandu [1,350m/4,429ft], transfer to hotel. Day 25 – 26: Contingency day. Day 27: Finally, we drop you in international airport. We will have 35 minutes of scenic flight in the morning from Kathmandu to Lukla Hillary airport, the most famous airport in the world. If the weather is favorable, during the flight, we will be sightseeing the most magnificent and sensational view of northern and eastern Himalaya vistas before our landing in Lukla airstrip 2,860 meters (9,383ft). After a few minutes’ break in Lukla bazzar, we set out to scenic journey to Phakding village. It’s way of 2 hrs and 30 minutes for normal trekker. The entire track crosses through famous mountaineering Sherpa villages, lodges, shops, gompas (monasteries), mani walls, prayer stones, payer flags and more than two well made suspension bridges with fascinating landscape on the way to Phakding. The trail moves ahead weaving lots of up and down to reach to Phakding village 2,610 meters (8,563ft), where we find clean and comfortable lodges with a little shopping and internet service. Today, we spend overnight at Phakding in lodge. Today we journey to Namche bazzar 3,440 meters (11,286ft), the main entry gate way of Khumbu valley, the capital of Sherpa people where is the available of luxurious Hotels, banks, shops, trekking equipments and climbing gears, bakery and café and governmental administrative offices for Sagarmatha National Park with Internet services. Today, we walk about 5 to 6 hours to reach Namche bazaar from the Phakding village. The trail more slightly ascends up following Duddha Koshi River to confluence (Dovan) of Duddha koshi and Bhote Koshi River. Finally, we push up strenuous uphill via weaving trail to Namche bazzar. Today we cross 05 well made suspension bridges including Hillary Bridge and few small wooden bridges, Sherpa settlements, Mani walls, prayer stones, waterfalls, rhododendron and blue pine’s forests. While walking on the way, probably the wild animals and birds can be appeared such as Himalayan goat (Thar), Jharals, musk deer and Himalayan pheasant Laphoforous (Danphe) a colorful bird. After walking of 2 to 3 hours we reach Sagarmatha National Park at Jorsalle. Where is required our permits. We make short break to register the permit and then head out to lunch place around Jorsalle. Everyone has dreams to see Mt. Everest in the life, it’s possible today on a clear day. The Mount Everest appears in front of us after a short walk uphill from the Hillary Bridge. We spend overnight in lodge in Namche. After breakfast, we go on a hike to the Everest view Hotel, established at the highest elevation in the world, 3,870 meters (12,697ft), for stunning Mountain panorama of Amadablam, Thamserku, Lotse, the Everest and Tauche and many more others Mountains. Then our trip continues for the worth sightseeing of Khumjung valley. After wonderful side trip, we head back to Namche bazaar. Finally we visit mountain museum in Namche. We stay in lodge including breakfast, lunch and dinner with tea or coffee service. This morning very early we start walking to south slope of Rengo La pass [5,360 meters/17,585ft]. The top offers thrilling panoramic views, including 4 over [8,000 meters/26,246ft]. Mountains. Cho yo [8,201 meters/26,906ft], Everest [8,848 meters/29,029ft], Lotse [8,516 meters/27,939ft], and Makalu [8,463 meters/27,765ft] and many others below [8,000 meters/26,246ft], mountains are today’s attraction. Today, we walk about 7 to 8 hours to reach Gokyo Lake. The track will pass thoroughly grassless land, snow-filled hill, moraines and glaciers. The Gokyo Lake is the phenomenal. In overall, the trip becomes fabulous with mind blowing views. We stay in lodge included dinner and breakfast service with hot drink like a tea and coffee. Today we will climb to Gokyo Ri early in the morning for fascinating views, The trail steeply ascents up to Gokyo Ri [5,357 meters/17,575ft], from the Lake. Absolutely up trail is not easy for all hikers but from the top, there are mind blowing views. It can be sighted views of 4 over [8,000 meters/26,246ft], Mountains, like Mt. Choyu, [8,201 meters/26,906ft], Mt Everest [8,848 meters/29,029ft], Mt Lotse [8,516 meters/27,939ft] and Mt Makalu [8,463 meters/27,765ft] and below [8,000 meter's/26,246ft], numerous others mountains, noticeable landscape which lies down Ngozumba glacier with beautiful Lakes. We stay in Gokyo lodge for second night. After breakfast, we hike to Fifth Lake following up edge of the Ngozumba glacier in the morning and after hot lunch, we leave to Thagnag 4,700 meters (15,420ft) the last settlement before Cho La pass. We traverse onto the Ngozumba glacier and moraine making short walk about two hours from Gokyo Lake. The trail then straightly moves to Thagnag. We stay at lodge included dinner and breakfast service with hot drink like a tea and coffee. Leaving from Thagnag the trail gently ascends to Cho La pass [5,375 meters/17,634ft], and then trail descends to Dzunghla valley. It takes 7 hours to reach Dzunghla Lodge from Thagnag lodge. The pass is considerable with crevasses, rock and snow falls, so we have to pass it before 10 A.M. We have to walk beneath the Cho La hill before and after passing it. That’s the reason we wake up at 4 A.M early in the morning to have some cup of tea with light breakfast. After some cups tea with light breakfast, we start to ascend up-hill trail to Cho La col with head lamp at dawn. The track passes wilderness Yak pasturelands, moraine, and snow land, glacier and rock slab before we reach Dzonghla valley. We stay in lodge included dinner and breakfast service with hot drink. Today, we climb Kalapathar, a picturesque top 5,550 meters (18,208ft), early in the morning for superb Everest view. It will be lifetime experience to be at 5,550 meters (18,208ft) and in front of the world’s highest peak. After clicking some pictures from the top we descent to Gorapse for breakfast and head for Everest base camp 5,364 meters (17,98ft). The track crosses moraines, rock falling zones and after scrambling onto the moraine reach to Everest base camp. After breathtaking landscape of Khumbu ice fall we trek back to Gorapse Lodge. We spend overnight in lodge included dinner and breakfast with cups of tea or coffee. From Gorapse, after our normal breakfast and hot drinks, being fully prepared, we trek down toward the Lobuche East high Camp. After trekking some distance on moderately flatter land, the trail to the Lobuche Base Camp gets upwards more vertical and rocky. We will walk ahead along the Lobuche Glacier with required gears like walking poles, (sticks) crampon where we can enjoy the grand views of Ama Dablam, Cholatse, Pokalde, Thamserku. We take dinner as early as possible and go to bed. The next morning, we will get up supper early to start climbing. Today is our cherished day for the summit. We start our trip early in the morning 02 O’clock to endeavor the summit. We climb on a steep up with the support of fix line rope and main rope. Lobuche East offers more panoramic views of the mountains and other popular peaks. Once you summit Lobuche, you would enjoy magnificently panoramic views of Everest, Lhotse, Nuptse, Ama Dablam, Cholatse, Pumori, and many more. We spend some time at the summit celebrating and taking pictures, then we get back to the Base Camp again. This is a trekking day to the peak, so we have to climb it while trekking, but there is no guarantee that we will have favorable weather on our planed day 14 for the summit, incase got bad weather we need some spare days for next try, so we have a reserved day today. 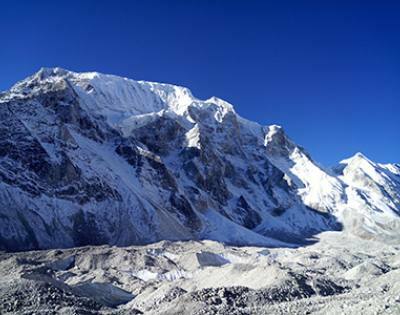 Leaving to Chhukung, we traverse onto Khumbu glacier, climb steep slope of Khongma-La pass with some difficulty. Although strenuous way to ascend up, the saddle is unbelievable for view to our backward. Such as Labuche valley, Labuche peaks, Cholatse peak, Pumari and many more others mountain’s magnificent view. After captivating Mountain View, we descend to Chhukung through shaded ravine. Today, the path passes Khumbu glacier, Khongma La, wilderness lands to reach Chhukung. Overnight in lodge included dinner and breakfast service with hot drinks like a tea and coffee. Having climbing practice and good enough acclimatization in Chhukung, today we move towards Island peak base camp [4,970 meters/16,305ft], following tiny rugged trail to Base camp. After walking continue 3 hours journey more gradually up track with unmatchable landscape, we catch Island peak base camp, where ends the trip of today. We stay at tented camp with full camping service. Prepare the climbing gears and material for next day. Today, we are really exciting to take wonderful an experience on top. We wake up at 00: 00 mid night for breakfast and climbing preparation. We leave from high camp at 01 AM for summit. After short walk from high camp, the route is fully gravel, rugged and moraine before you reach crampon point, then track moves to huge challenging crevasses before to reach slope of peak. Finally we climb 80/85 deg’s slope and some sharp ridge with support of fixed line rope to attempt main summit. On top of peak is unquestionably amazing for view. From an altitude of [6,189 meters/20305ft], we savor mesmerizing views of Amadablam, Barunje, Chhopla, Amphu peak, Lotse shar, Lotse down deeper enchanting valley, descend to Chhukung. Overnight in lodge included dinner and breakfast service with hot drink tea and coffee. Today we trek back to Jorsalle - Manju via the famous Sherpa town Namche bazzar, the capital of Sherpa people. Leaving from Tengbuche the trail steeply drops to Phungathanga, a Sherpa hamlet, where we will cross well made suspension bridge over Dudha koshi River then the trail moves towards Namche bazaar rising up. We break in Namche for lunch then trek to downhill meeting point of two Rivers Bhote koshi River and Dudh koshi River. We cross the Hillary bridge over the Dudha koshi and walk continue following down River, crossing well made suspension bridges and passing Sherpa lodges and villages to reach Manju. Overnight in lodge included dinner and breakfast service. Kathmandu/ Lukla/ Lukla/ Kathmandun flights fare. Entry permits: Two peak’s permits, Sagarmatha National Park fee and Pasang Lhamu Municipality fee. All necessary trekking, peak permits, garbage management deposit. Climbing grouping gears, dynamic Ropes, static Ropes, Snow bar, Ice crew, Carabineers, Runners, Rock Pitons, Auxiliary cords. Two man sharing tent, comfortable mat, dining hall, arm chair, clean table with solar light. Satellite Phone & PAC bag (Portable Hypobaric Chamber), prevention AMS & HAPE (Pay extra). We have available of personal climbing gears, Harness, Helmet, Jumer, Crampon, Ice, boots, Figure of 8 ( Pay extra in reasonable). Nepali staff’s, insurance policy covered it Emergency rescue evacuation, health, medical treatment and accidental. Down Jacket (-12*C) and Sleeping bags (-20*C), (Pay extra $1and 50 cents each item per day). We provide you climbing gears in reasonable cost (Pay extra, it will be negotiable). Company's complimentary; Duffle bag, Map and Company T-short. Trekker’s travel insurance policy should be covered it rescue evacuation, medical treatment and accidental. Climb peaks with mountain leaders and with full broad base service. If you do not have own climbing gears we will provide you on hire at a reasoable cost. We Himalayan Diamond Adventure use truly gears the Union of International Alpinist Association tested one. Its moderate difficult to climb amongst the trekking peaks. It requires 27 days holiday to accomplish trip. Both peaks do not require previous mountaineering skills, but these peaks require good acclimatization and good level of physical fitness and proper gears placing knowledge. It’s more safer to climb in climbing peak seasons, rather than other seasons. We provide you tourist standard Hotel in Kathmandu for 3 overnights with breakfast service. And, if you do not have own mountaineering gears you can take on hire it at reasonable cost with us. Like Helmet, Harness, Crampn, Jumer, Figure of 8 and Carabineers. We provide you genuine gears (Black Diamond, Petzel, Grivel and Beal brands). We stay in the lodges for the period of trekking and in tent for the night on base camps. Its the most picturesque trekking route in Khumbu area. To reach in Himalaya, we will take 35 minutes scenic flight from Kathmandu to Lukla, fly along the northern to eastern Himalaya range of country, on a clear day is in itself an exciting and memorable experience as exotic panoramic view of northern – eastern Himalaya range. The trail passes to base camps through the famous mountaineer Sherpa settled village it’s naturally, culturally and rich with flora - fauna too. The Namche bazzar (Sherpa capital) is most admired land for trekkers or climbers in this Khumbu region. The lost in diversity, Shangri-La of Himalaya, feel wild, nature, culture and warm hospitality. It will be an extra lifetime trekking and climbing experience; in the life, due to its viewing route and summits. Remarkable views of towering snow capped peaks, Khumbu Ice fall and Khumbu glacier. Closed to be the world’s highest peak Mount Everest [8,848 meters/29,029ft]. Island (Imja-Tse) and Labuche both peaks are technically difficult to climb, but who are in quest for exhilarating climbing, if they are well acclimatized and good level of physical fitness, can unquestionably make it. The simple reason; we have a very professional guide in mountaineering who are highly experienced in Island peak and Labuche climbing, very well practiced informants about weather forecast and caring personals as your climbing guide. We Himalayan Diamond Adventure provide you truly gears the Union of International Alpinist Association (UIAA) tested enough climbing grouping gears. Apart from this, such climbing highly requires your physical fitness and climbing gears placing knowledge, that’s on your hand. Island and Labuche both trekking peaks are one of the most popular trekking peaks in Mahalangur Himalaya range of the Everest region in Nepal. These expeditions can be combined with the most popular Everest Base Camp trek in the world and an exceptional viewing points Renjo La pass, 5,360 meters (17,585ft), Gokyo fifth lake, Chola pass 5,365 meters (17,601ft), and Khongma La pass 5,535 meters (18,159ft). The guide instructs you lot In Labuche and Island peaks base camp time, before head over summit. The guide tips you very important climbing techniques, like glacier travel; walk on ladder skills, Active rappelling (Up sailing), and Safety placement, proper arrange of gears and equipments while climbing and use of proper climbing gears. After appropriate acclimatization and well prepared to push summit, we will ensure favorable weather forecast. We always stand on our quality of weather forecast service. Its affiliated with government of Nepal (Meteorological Division) Mountaineering is itself dangerous cause of high altitude, frostbite, hypothermia, blindness, snow fall, rock fall, avalanches, crevasses and white out.